It’s highly likely a version of this outfit may have appeared on this blog before. I’ve said it before and i will probably say it again (i know, i know, broken record much Rachel?!) but this is my uniform. My easy peasy throw it on and take on the world outfit. 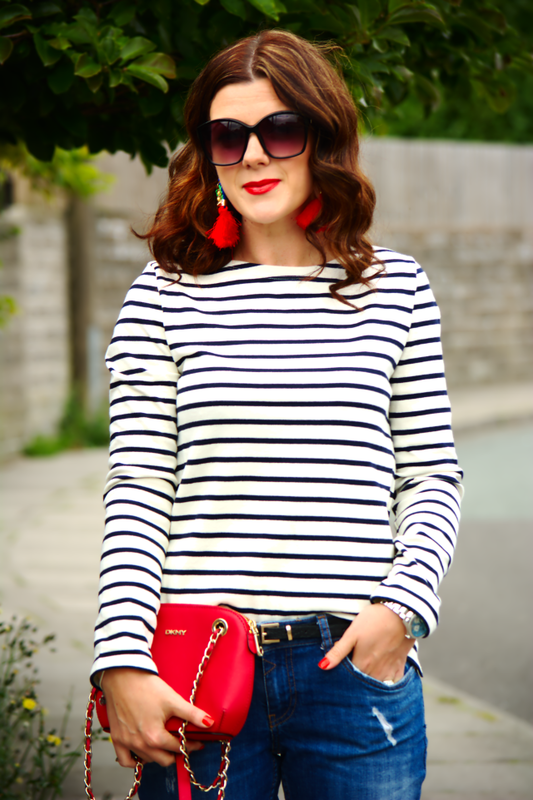 Breton tops have a lot to answer for on the parisian front (do Parisian’s even wear breton tops? do let me know as i am actually very curious haha!) As soon as i don a striped top I instantly want to channel my inner tres chic mademoiselle, gracing the cobbled streets of notre damn. I mean obviously i’m not even close, i’m actually clomping along the paved streets of a little Welsh town in the hills. But what the heck, maybe i can look a little bit the part… just a smidge, right? Speaking of breton tops, i did a quick count up recently of how many i own and i’m at the grand total of 16, different colours (red, black navy) but yes. 16. Well actually this new Petit Bateau makes it 17. And this one is by far the nicest. Firstly its genuinely french, extra style points for that. But the whole fit and texture of the top is soooo nice. The quality is spot on too which i really like. 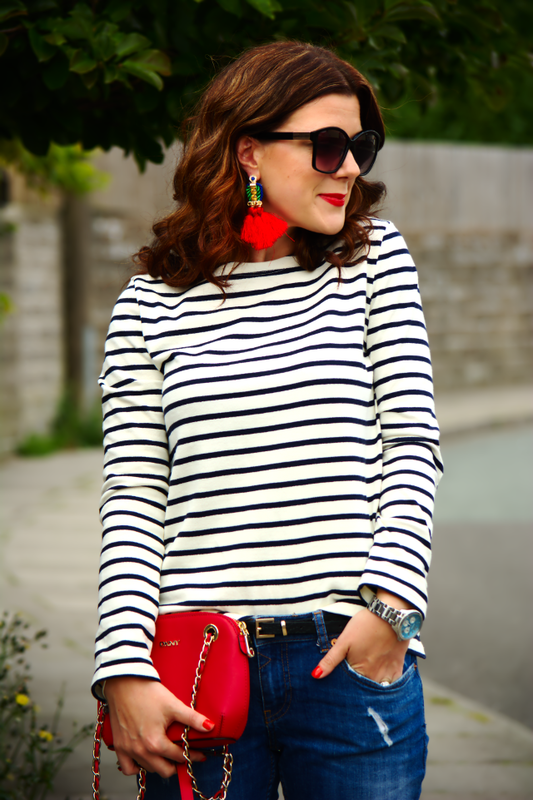 Search for the perfect breton top is finally over! Nice one Petit Bateau. 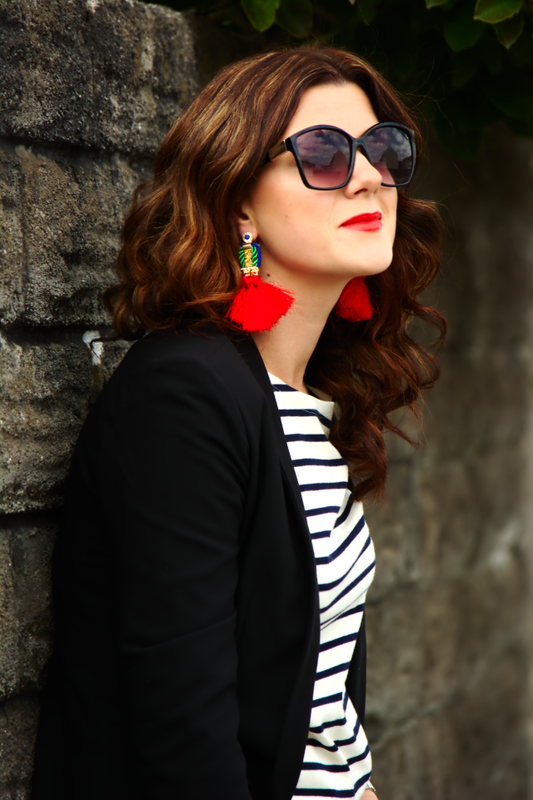 Just a quick note on the earring front… can you tell how much i am loving these Matador tassel earrings? Aren’t they fun? They just add the best pop of colour to a monochome look. I love them, plus because they’re basically thread it means they aren’t heavy like some statement earrings. You can get them here! Also i mentioned on Instagram(are we instagram buddies? We should be.. gimme a follow and i love to follow along with you. Its my favourite social media network to chat to blogging buddies on!) that i am totally digging anklets. I bringing them back from my youth. They’re just so pretty and remind me of holidays. Gimme a limb or appendage and i will happily decorate it haha! This ones from the new Yosa Simply range and they’re only going to be about £5! 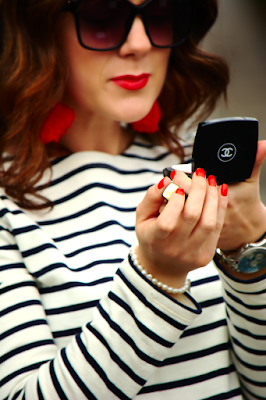 So yes, Parisian chic is my uniform..
Do you have a uniform that you always default back to? 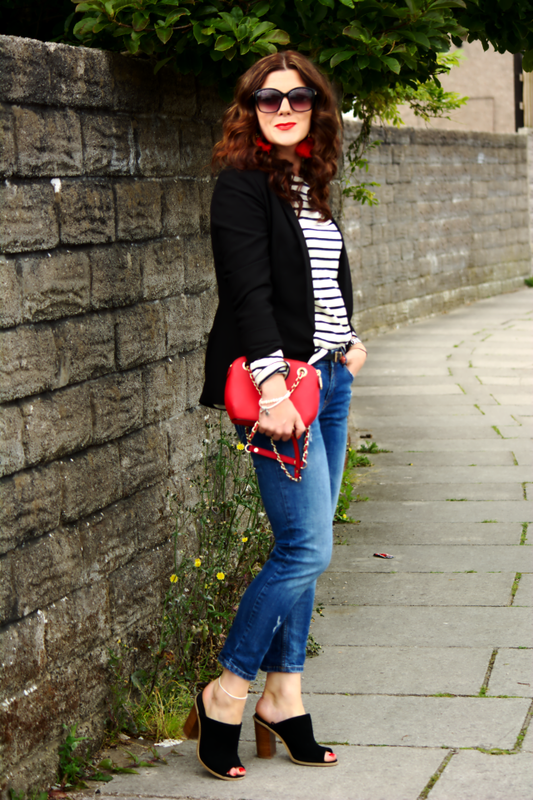 I've loving the pop of reds with this outfit Rachel. Those earrings make the perfect statement! Absolute perfection! You look amazing. Greetings from Martina, Elegant 40! 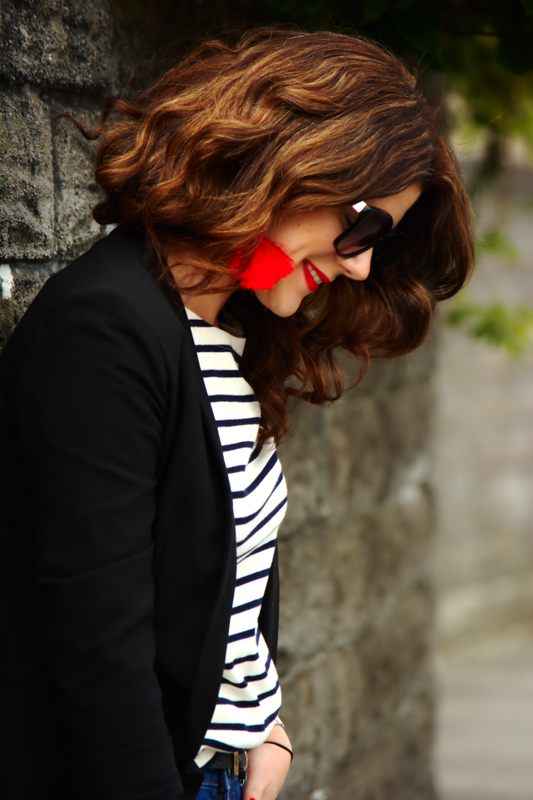 Such a great effortless chic look and I adore those fun and vibrant earrings. You look so glorious, it's unreal. You can very go wrong with a Breton! Love this classic look. I have SO many Breton tops! 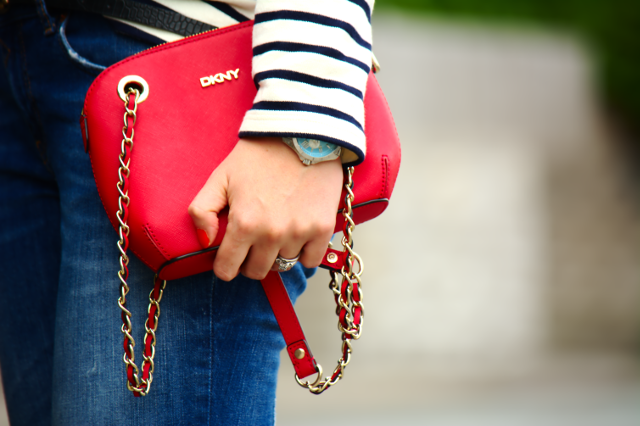 This looks gorgeous on you and so chic with the red! Love it. SO classic. I was recently home in the US and stocked-up on a bunch of t-shirts. When I opened my suitcase, I realised that every last one of them was stripes. Every. Last. One. Whoops. Love love love this look, amazing style! One can never have enough breton tops. Especially when they are so easy to dress up and/or down. I love this pairing. I love every last detail of this look! Bonus points for the top being genuinely French! I just love this outfit. It's simplicity is wonderful and I love the fun addition of your earrings. Perfect! What a super cute outfit Rachel! If you think you wore it or something similiar on the blog before I say whatever and do it on repeat if you love it enough. You look lovely! 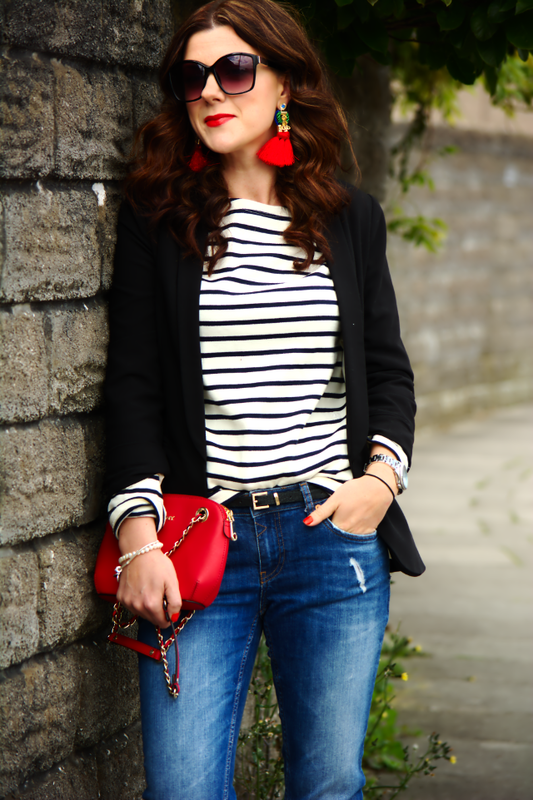 Woah… stripes, tasseled earrings, mules, pops of red… these are things I'm OBSESSED WITH and there all here! Another fine outfit… as usual. You never disapoint! I'd love it if you shared your posts with my readers at my Friday Finds Link-Up. Please come!